The Global Charter-Agenda for Human Rights in the City aims to promote and strengthen the human rights of all the inhabitants of all cities in the world. Its provisions apply to all city inhabitants, individually and collectively, without discrimination of any kind. Our Committee drafted the Global Charter-Agenda for Human Rights in the City in order to contribute to the international promotion of human rights and the right to the city. This initiative emerged from the Forum of Local Authorities for Social Inclusion and Participatory Democracy (FAL) that took place in Caracas in 2006. Based on the discussions between local governments from around the world, a group of experts from various countries wrote a first draft (2007-2008), which was then discussed and amended by elected representatives, experts and representatives of civil society from all over the world (2009-2010). Under the leadership of Barcelona Provincial Council (Diputació de Barcelona) and of the city of Nantes and the Pays de la Loire Region, the Global Charter-Agenda was collectively discussed at several international events. Research centers such as the Catalonia Institute for Human Rights (IDHC) and the Social Studies Centre (CES) of Coimbra University were also involved in this process from the very beginning. The added value of the Global Charter-Agenda for Human Rights in the City is that each human right featured in the document is accompanied by an action plan that serves as reference for concrete steps to undertake by local governments. Signatory cities are invited to set up a local agenda with deadlines and indicators in order to assess their efficiency in implementing these rights. The Charter-Agenda will come into effect in each city after a consultation and participation process allowing residents to discuss it and adapt it both to local reality and to the national legal framework; and upon acceptance by a qualified majority of the municipal assembly. The result of this process will be the adoption of a Local Charter-Agenda in each signatory municipality. 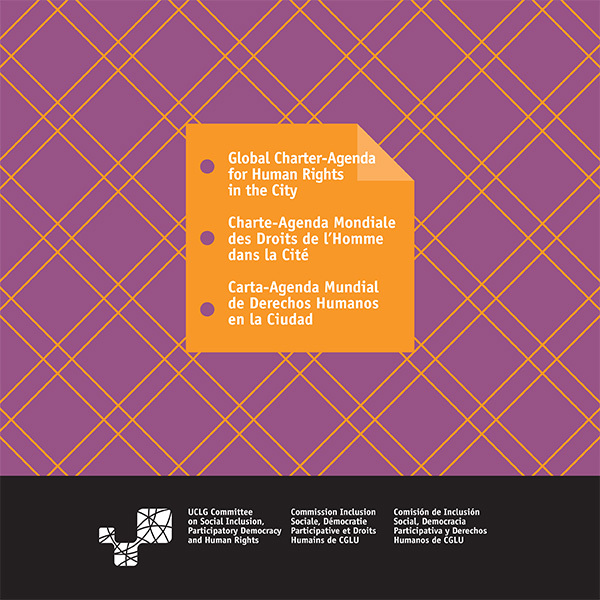 The World Council of UCLG held in Florence in December 2011 formally adopted the Global Charter-Agenda for Human Rights in the City and invited all UCLG members to sign it. In the current situation, the Charter-Agenda is a tool for local governments to build more inclusive, democratic and solidarity-based societies in dialogue with urban dwellers.